Bake425, a bake at home, farm-to-crust pizza concept recently approached me to taste their unique easy-bake pizzas along with a fresh salad and a giant cookie! The folks from Bake425 are the same people that brought you the former Homemade Pizza franchise, but now with healthier options! Bake425 sources as many ingredients as possible from nearby farms in order to bring eaters the freshest flavors while supporting the local economy. At this time they are currently located in Highland Park, Winnetka, Lake Forest, Hinsdale and Evanston. During our last month in Chicago we tried to cram in as much eating as possible, hitting up old favorites and even adding a few new ones to our list. If you haven’t already heard, Taste Tester #1 and I are quitting our jobs to travel the world! Read our big announcement here. During our crazy planning and packing a company like Bake425 was a life-saver when almost all of our utensils and kitchenware was packed up. The whole process was super easy and delicious! I had the chance to try one of their artisan pizzas, the poblano and chicken sausage with tomato sauce, shredded mozzarella, chicken sausage, poblano peppers and ricotta. The pizza arrives completely assembled, just unbaked, and all you need to do is heat your oven to 425 degrees and pop it in for 12-15 minutes yielding perfectly golden cheese and a crispy crust. 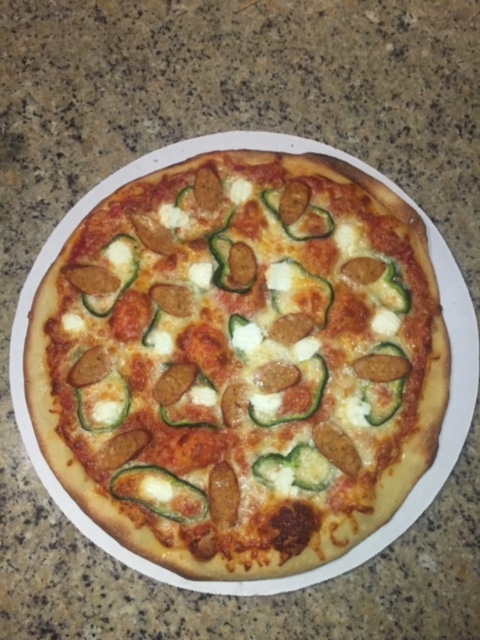 I have to admit I was a bit nervous that the crust wasn’t par-baked as I’ve had bad experiences making my own pizza and not baking the crust at least a little bit first before adding the toppings. I was happily surprised that even the bottom of the crust got a nice golden brown and the edges were perfectly crunchy. This flavor combination was right up my alley. I loved how the poblano peppers were slightly spicy and the chicken sausage was a bit sweet so it was a great balance, combined with the tangy tomato sauce and creaminess of the ricotta cheese it was delicious. Bake425 also included a pear and blue cheese salad with a mix of romaine, spinach and arugula topped with caramelized walnuts, pears, blue cheese and a thick raspberry vinaigrette. The simplicity of this salad was absolutely delicious and the pear, blue cheese and walnuts worked really well. Often salads are so one-note with just one kind of lettuce, this was not the case with the delicious mix of greens. Our meal finished up with a giant chocolate chip cookie that was the perfect sweet ending. I was impressed that for the size of the cookie it baked so evenly in the oven and came out soft and chewy all around. Bake425 provided a complimentary pizza, salad and cookie, but all opinions are my own.